Now you can experience the same authentic feel with our nostalgic ice cream cart for your next party or special event. Our ice cream carts work with dry ice. No electricity required. Each ice cream cart has 12 cubic feet freezer space. lots of room for all your ice cream treats. 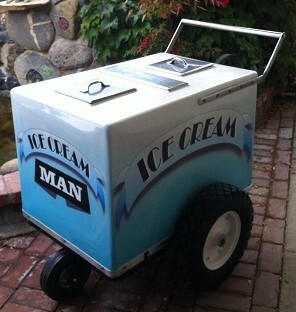 Cost of ice cream cart rentals is $145.00 this includes delivery, pick up and dry ice, $100 without dry ice. You supply your favorite ice cream treats.